(Kingston, Ontario, Canada)- Thirteen teams took on the 2018 J/24 Canadian Championship held August 18-20 in Kingston, Ont. Michael Howarth’s crew started hot, winning three of the first five races, and held off a late charge by David Ogden to take the title. Ogden’s team won the final four races but still finished five points back in the 9-race series. Peter Dixon finished one point further back in third overall. Rounding out the top five were Jean Levac in fourth with 38 pts and Edmond Rees in fifth with 42 pts. 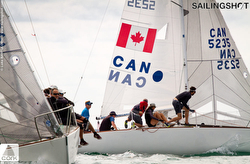 For more Canadian J/24 Championship sailing information Add to Flipboard Magazine. 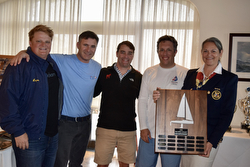 (San Francisco, CA)- This past weekend, the St Francis YC hosted one of their favorite events of the year, honoring one of their long-time supporters of both offshore handicap and one-design sailing on San Francisco Bay- the Phyllis Kleinmann Swiftsure Regatta. Nineteen J/105s showed up for the party on and off the water. After five races, it was apparent the entire podium was going to be determined by a cliffhanger finale in the last race. Anyone could have won amongst the entire top five, so close was the racing along the San Francisco city waterfront. In the end, Tim Russell’s NE*NE won the countback on a tie-breaker for first place with Ryan Simmons’ BLACKHAWK. NE*NE was consistent from the start and faltered a bit in the end, posting a 4-1-1-2-8 for 16 pts. BLACKHAWK had a 3-3-2-7-1 tally to nearly pull off the class win, also finishing with 16 pts. Just out of the money was Bruce Stone’s ARBITRAGE, posting a roller-coast tally of 1-6-3-6-3 for 19 pts total to just hang on to third place. Fourth went to Ian Charles’ MAVERICK with a 6-7-4-1-2 record for 20 pts. Then, fifth place was Doug Bailey’s AKULA with a 2-2-6-4-10 for 24 pts total. In short, had AKULA won the last race, they could have won the regatta! And, that was apparently the case for the rest of the teams in the top five! J/Crews cleaned up in their respective ORR Divisions. Reuben Rocci’s J/111 SWIFT NESS won ORR B, while Barry Lewis’ J/120 CHANCE won ORR C with straight bullets! For more Phyllis Kleinmann Swiftsure Regatta sailing information Add to Flipboard Magazine. (Riva del Garda, Italy)- Lake Garda lived up to its “bucket list” reputation on the opening day of the J/24 World Championship in Riva del Garda, Italy. Eighty-nine teams from 14 countries (Australia, Brazil, Denmark, France, Great Britain, Germany, Greece, Hungary, Ireland, Italy, Japan, Netherlands, Sweden and United States) descended on the picturesque lake for the 40th edition of the Championship. With sunny skies and breeze at 10-15 knots, American Will Welles’ Kaster got out of the gate with the early advantage, posting 2,5,2 for nine points in the three races. Hungarian Tomai Bala’zs’ J.Bond 037 started the day strong with 1,2, but a 13 in race three left him with 16 points for second place. Travis Odenbach’s Honeybadger of the USA rests in third place with 29 points. Bala’zs opened the regatta with a victory, ahead of Welles and Italian Ignazio Bonanno’s La Superba. Keith Whittemore’s Furio, USA, took the next battle, as Bala’zs dropped to second and Duncan McCarthy’s Madeleine of Great Britain put another nation on the leaderboard. The final contest saw McCarthy, Welles and Whittemore comprise the top three. 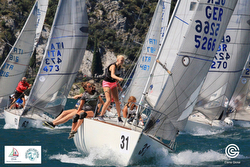 The leaderboard tightened up Tuesday at the J/24 World Championship in Riva del Garda, Italy. 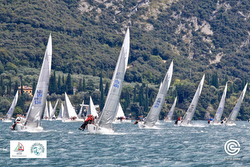 Lake Garda again produced fantastic conditions as the 89 teams recorded two more races, bringing the total to five, including now one discard. American Will Welles’ Kaster maintained the top spot with 18 net points, but Hungarian Tomai Bala’zs’ J.Bond 037 is just two points back in second place with 20, and Nobuyuki Imai’s Siesta of Japan launched up to third with 21 points. Both Welles and Bala’zs stumbled in the day’s final race, but benefited from the throw-out. 2016 World Champion Daniel Frost’s JJOne of Germany ruled the day, winning the first contest, and placing second in the next. Following Frost in Tuesday’s opener were two Americans: Keith Whittemore’s Furio and Travis Odenbach’s Honeybadger. Imai’s Siesta also had a solid day, leading the fleet home in race five, ahead of Frost and fellow Japanese sailor Tomomi Hatakeyama’s Gekko. 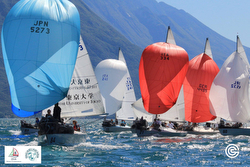 Lake Garda delivered more of the same champagne conditions on the middle day of the J/24 World Championship in Riva del Garda, Italy. American Will Welles’ Kaster showed the same consistency, posting two second place finishes in Wednesday’s pair of races. Welles now boasts a seven-point advantage over Nobuyuki Imai’s Siesta of Japan, who won the opening contest but added a seven in the next. Daniel Frost’s JJOne of Germany continued his ascent up the rankings with a 4,3 to move into third at 36 points, with Keith Whittemore’s Furio of the USA looking over his shoulder one notch back. Imai’s Siesta stayed hot, winning the opening match Wednesday in the familiar 10-16 knot lake winds. Welles and Whittemore followed. Whittemore’s Furio earned his first bullet of the series in race seven, with Welles repeating in second and Frost third. For more J/24 World Championship sailing information Add to Flipboard Magazine. 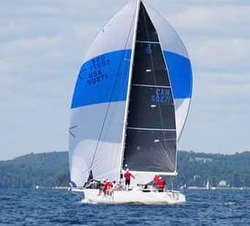 (Chester, Nova Scotia)- After three nearly perfect sunny days, sailors brought out their foul weather gear for the fourth and final day of racing at Helly Hansen Chester Race Week 2018. Thick fog, swells and rains that varied from a sprinkling to torrential downpour didn’t dampen enthusiasm at the many start lines. Throughout the week, all four one-design fleets were extremely competitive, moving as one through their courses. It takes an extra edge to lead a fleet where all the boats are essentially identical. Doing exactly that in the J/105 class was Sean McDermott and Rory MacDonald’s McMAC, winning the class counting all bullets in five of six races. Counting virtually all 2nds was Jim Mosher’s MOJO to take the silver with 10 pts in 5 races. And, rounding out the podium was Barry Eisner’s BUZZ with 13 pts. The Inshore 1 Class was simply dominated by an enormous J/Navy. Leading the sweep of the top five were all J/29s! Jane Filbee’s PAINKILLER marked the first time a woman skipper/ owner topped the class. Second was Chris MacDonald’s SCOTCH MIST IV (a previous regatta winner), third went to Don Williams’ PARADIGM SHIFT, fourth to Terry Schnare’s HEAD GAMES, and fifth was Scott Covey’s RUMBLEFISH. Dominating all four Distance Classes were J/Crews! Winning Distance 1 Class was Stu McCrea’s J/120 DEVIATION. Another J/120, Rick Calder’s BRILLIANCE took fourth. Andrew Childs’ J/35 HELOC led a sweep of Distance 2 Class. Second was Larry Creaser’s J/100 YOUNGBLOOD, third went to Rod Johnstone (yes, the designer) and Gary Bennett’s J/35 J’AI TU. The balance of the top five included Thane MacDonald’s J/35 J-HAWK in 4th and Peter Traves’ J/35 CRACKERJACK in 5th position. Distance 3 Class saw long-time J/92 veteran Colin Mann again wins his class on the famous POOHSTICKS. Then, in Distance 4 Class, Jesleine Baker’s J/30 JUST ADD WATER marked yet another win by a woman skipper/ owner; and at that, winning with all firsts as counters! Taking fourth was Jordan MacNeil’s J/30 FLUX. For more Chester Race Week sailing information, follow here on Facebook Add to Flipboard Magazine. NEW Bacardi Winter Series 2018/ 2019! (Biscayne Bay, FL)- The 2017/18 racing season on Biscayne Bay saw the formation of an action-packed new class, the J/70s. The hottest sport boat in sailing has come to Miami in a big way. Nine boats now call Miami home and are ready for an exciting 2018/2019 racing season, with several new regattas added to the calendar (see story on right). This is the first new class to call Biscayne Bay home in many years and the excitement is building with other owners planning to join. There is even a Swedish team planning on buying a boat and keeping it in Miami to escape the Swedish winter. Bacardi has announced a thrilling new series to be held on Biscayne Bay for the 2018/ 2019 racing season. The Bacardi Invitational Winter Series for the red-hot J/70 class will feature two regattas leading up to the grand finale- the Bacardi Cup. 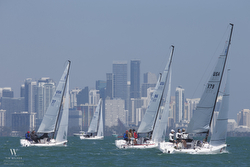 The Winter Series regattas are December 1–2 and January 19–20. There will be trophies for each event, plus trophies for the entire three-event series, which culminates with the Bacardi Cup Invitational Regatta on Biscayne Bay in March. For more Bacardi Cup J/70 Winter Series information Add to Flipboard Magazine. (Cowes, Isle of Wight, England)- The 2018 Sevenstar Round Britain and Ireland Race started from the Royal Yacht Squadron line at noon on Sunday 12th August, immediately after Lendy Cowes Week. The 1,805 nautical mile race around Britain and Ireland was organized by the Royal Ocean Racing Club every four years and will go down in history as one of the toughest races yet in the quadrennial event. For the 2018 race, 29 teams with close to 200 professional and Corinthian sailors started the race. Over a dozen dropped out over the course of time due to boat damage, human damage, or electronics failures. In fact, the weather forecast was so rough, the RORC reversed the route to protect the fleet from a potential battering. In layman’s terms, that meant that fast reaching/ running boats would enjoy an enormous advantage for 85% of the race. The normal course is counter-clockwise, going around Britain first to the east, then around Ireland and back to the finish. The clockwise course meant the fleet sailed in mostly southwesterlies due to a large depression northwest of Ireland- a fast reaching port gybe from southwest Ireland to the northernmost point of the course at Muckle Flugga. Racing in the IRC 2 Class and the IRC Doublehanded Class was the Dutch duo on JUNIQUE RAYMARINE SAILING TEAM (Chris Revelman & Pascal Bakker). For most of the race, they lay in fourth place in both IRC Double and IRC 2. However, as the race progressed, their perseverance produced gains on their much faster offwind competitors. And, as things slowed down on the eastern shore of England, heading back down into the English Channel, they made enough gains to ultimately finish 3rd in IRC Doublehanded, 3rd in IRC 2 Division, and 5th IRC Overall! Considering Revelman & Bakker were sailing a standard factory-built J/122, that is an extraordinary achievement against some of the world’s top professional sailors all in custom and semi-custom modified boats that beat them. 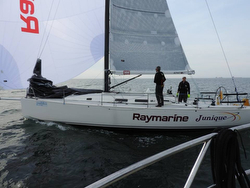 Congratulations to Revelman & Bakker’s tremendous achievement on their J/122 JUNIQUE RAYMARINE Sailing Team! For more Round Britain & Ireland Race sailing information Add to Flipboard Magazine. (Hilton Head, SC)- The 2018 Low Country Hook Ocean Race goes from Hilton Head, SC to the finish off the Landings Marina on Skidaway Island, GA- a 30.0nm distance race that took place on August 18th. 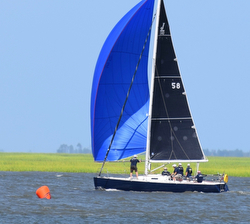 The race was presented by Skidaway Island Boating Club and The Yacht Club of Hilton Head. Twenty-four boats registered with nearly half the fleet in the PHRF Spinnaker class. Of those nine boats, six were J/Boats; including two J/105s, two J/24s, one J/30, one J/100, and one J/109. 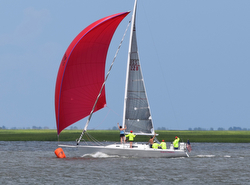 The race took the sailors out into the Atlantic, crossing the Savannah River shipping channel past Tybee Island, south to the entrance of Wassaw Sound, where the boats then maneuvered up the Wilmington River to the finish line north of Landings Harbor Marina. The “Hook Race” is named after the pattern of the race course- looks like fish hook. Winds were light from the southwest at the start of the race, allowing the J/105 and J/109 to fly their asymmetrical spinnakers. 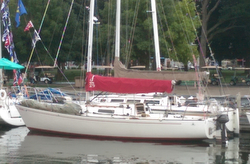 The J/30 had chosen to use their 163% genoa, which allowed her to keep up with the asymmetrical spinnakers. The J/100 attempted to fly their symmetrical spinnaker with the pole at the lowest position on the mast and all the way forward just off the head stay. At the end of the race, the Gebel Seese’s J/105 HIGH VISIBILITY from Savannah YC crossed the finish-line first on elapsed time, followed by Mike Foster’s Savannah YC crew on the J/30 RONIN, then Troy Lamb’s J/109 WAHOO from Savannah YC, then Paul Reddick’s J/100 BLU J from Skidaway Island Boating Club. 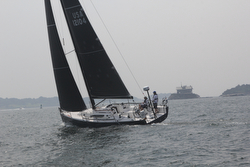 After PHRF handicap ratings were applied to the elapsed times, it was a convincing win for the Foster’s J/30 RONIN. Taking the silver meal was Seese’s J/105 HIGH VISIBILITY, followed by Lamb’s J/109 WAHOO in 4th, Reddick’s J/100 BLU J 5th, and Amar Patel’s J/24 ROGUE from Skidaway Island Boat Club in 6th position. Commented one of the crew members (and Co-Chair of the Race), Mark Winters, “It was a great day of racing, especially for those of us on J/Boats. I was on the J/100 BLU J. We competed well with the J/105 and J/109 upwind, but downwind it is difficult to compete with them unless the wind is aft of beam. 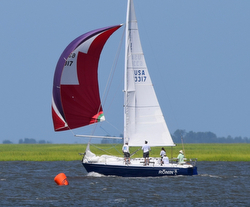 Had we elected to bring our genoa, we would have been right there with the J/30!” For more Low Country Hook Race sailing information Add to Flipboard Magazine. (Newport, RI)- The forecast was not the rosiest one might expect for an offshore race. However, with an impending front with rain showers forecast to roll into New England over the next twenty-four hours after the start, the slowly strengthening south to southwesterly winds eventually gave the fleet a reasonably quick race. In the end, the entire J/fleet finished before noon time in the 120nm long track they were given- start to “NB” buoy (traffic separation scheme buoy at the entrance to Narragansett Bay), then east to Buzzards Tower, back west to Montauk Bell, back east to Buzzards Tower, then round “NB” again to the finish. A simple course, but devilish in the details on how to maximize VMG (both upwind and downwind)! Fifty-plus teams raced the 14th annual Ida Lewis Distance Race that started August 17th in the Eastern Passage of Narragansett Bay between Jamestown and Rose Island in Newport, RI. Starting first, fast out of the blocks was David Southwell’s J/121 ALCHEMY, taking the lead right off the starting line in the PHRF Doublehanded Class and never looking back, winning their fleet on corrected by over three hours. Then, in the PHRF A Spinnaker division were three more J/121 sisterships. In their inaugural race, it was Greg Manning’s SARAH that took J/121 honors and was second on corrected, just a few minutes off from the lead. Though finishing only ten minutes back on elapsed time, Don Nicholson’s APOLLO finished 5th on corrected. What was fascinating about this duel was the differences in performance from the Montauk Point mark back east to the Buzzards Tower mark- a long starboard tack reach/ run under spinnakers. After the first four legs, APOLLO was leading boat-for-boat. However, Manning’s SARAH sailed lower and faster on the long leg back to Buzzards, passing APOLLO to leeward. Thereafter, it was close-reaching back to the “NB” entrance buoy to Narragansett Bay, then a quick spinnaker run to the finish. All five (5) J/Crews in PHRF Spinnaker B simply eclipsed their class, occupying all top five spots. Perhaps unprecedented in offshore sailing history, all teams sailed hard and fast and it was a duel to the finish on handicapped time for every boat. Winning was Bob Manchester’s J/120 VAMOOSE, followed by just 57 seconds (!) by Greg Slamowitz’s J/111 MANITOU in second, Paul Grimes’ race-winning J/35 BREAKAWAY Collegiate in third, Bill Kneller’s veterans on the J/109 VENTO SOLARE in 4th and “the kids” on the J/105 YOUNG AMERICAN YCC YOUTH taking 5th! Congrats to all, an amazing performance overall! For more Ida Lewis Distance Race sailing information Add to Flipboard Magazine. 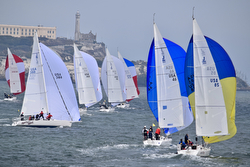 (San Francisco, CA)- The St Francis YC hosted the 2018 J/70 Pacific Coast Championship over the weekend of August 17th to 19th. As is typical for this time of year on San Francisco Bay, the seven teams racing in the event had to contend with strongly building seabreezes from the west that would peak up to 25-plus kts by late afternoon. Perhaps the most notable performance of the regatta was that of the Santa Barbara YC Youth Team on USA 1156, after the first day they were leading the entire fleet with a record of 5-1-1 for just 7 pts total. However, one of the kids got into an accident on Saturday evening, severely scraping his leg. As a result, on an even windier Sunday, the SBYC Youth Team did not want to risk their injured crew member, so bowed out of the last two races. Nevertheless, skipper Paul Harteck was ecstatic with their performance against the top West Coast J/70 teams. Ultimately, they finished in 4th place. Watch their YouTube sailing video highlights of their first (and only) day on the Berkeley Circle race track winning one of the races here. Winning the event by taking two bullets on the last day, obviously loving the nuking winds, was the trio of Scott Sellers, Harrison Turner, and Geoff McDonald on 1FA. Their record of 2-3-2-1-1 for 9 pts enabled them to be crowned the 2018 J/70 PCC Champions. Never far behind them on the race track was Chris Kostanecki’s JENNIFER team with a 3-2-3-2-2 record for 12 pts total. Then, ending up in the bronze on the podium was Tracy and Christine Usher on their boat- CHRISTINE ROBIN RACING- with a tally of 1-5-6-3-3 for 18 pts total. In the Corinthians Division, winning was Kostanecki’s JENNIFER, second was the Usher’s on CHRISTINE ROBIN RACING, and third was the SBYC Youth Team skippered by Paul Harteck! For more J/70 Pacific Coast Championship sailing information Add to Flipboard Magazine. 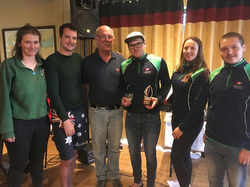 (Foynes, Ireland)- The Irish J/24 National Championship concluded at Foynes Yacht Club in a light to moderate westerly breeze. The Foynes YC PRO- Derek Bothwell- was able to start on schedule for the first time the entire weekend after hours spent waiting around for wind for the previous two days. Race six of the championships got off to a clear start with the fleet splitting both left and right on the course in a flooding tide. 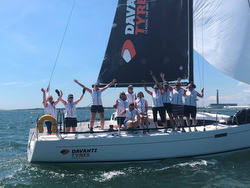 GALA RACING, who went right on the first beat and left on the second, got their first win of the championship followed by Howth YC’s Under 25 team SCANDAL in second and Tim Corcoran on CRAZYHORSE in third. As the tide strengthened and wind lightened, the race course was shortened before the start of the final race of the event. Flor O’Driscoll’s HARD ON PORT tacked off to the right immediately after the start, keeping further right than any other boat and emerged with a clear lead by the windward mark. A battle for second developed between JIBE, CRAZY HORSE and JUMPIN JIVE who exchanged places numerous times on both the upwind and downwind legs, with CRAZY HORSE finishing in 2nd just ahead of JUMPIN JIVE. With the championship complete, attention turned to the prize giving. There were multiple changes in positions in the fleet after the final two races. 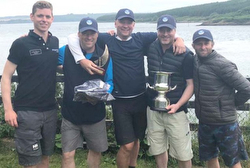 In Gold, Royal Cork Yacht Club’s Stefan Hyde on MAURICE JOHNSON & PARTNERS became the new Irish J/24 National Champion for 2018. The new Under 25 Irish National Champion is Harry Cronin and his SCANDAL team from Howth Yacht Club. A number of initiatives brought in for this year’s event were very successful. The trialing of On-the-Water Judging conducted by Gordon Davies was well received by the competitors. Also, the introduction of a Bronze Fleet made for competitive sailing for all competitors. Here are the complete results for each of the fleets. The association acknowledged the support of the sponsors of the event and ICRA for their support and finally the host club and its members for a great weekend of sailing! Thanks for contribution from AFLOAT.IE in Ireland for the report Add to Flipboard Magazine. (Riva del Garda, Italy)- The first J/24 World Championship took place in 1979 in Newport, RI. It was a memorable event. For four days, crews from around the world in the 72-boat fleet fought for world supremacy. However, there was a “special race” that made it especially memorable for all participants that first year. On the last day of the event, the J/24 Worlds had their famous “long distance race”. In Rhode Island, there is ONLY one long distance race- the infamous “Round Island Race” of Jamestown- a 21.0nm affair. It was a benign race to start off with; a mid-teens genoa windward beat to the first mark off the end of Beavertail Point Lighthouse. However, from there on end, the Worlds would forever go down in infamy as one of the craziest races ever in the history of the J/24 class. The weather forecasts were a bit odd that day, sunny, partly sunny, but rapidly-building winds from the SSW. By late afternoon, possible thunderstorms and squalls were forecast. As it turns out, the Low/ depression grew considerably in strength as it hit the New England coastline. On the downwind run in the West Passage of Narragansett Bay, the winds rapidly increased from a benign SSW 12-18 kts to gusts well into the high 30s from the WSE! Boats were broaching everywhere, spinnakers blown out, crews hankering down for more severe gusts as squall after squall rolled over the race track. What?? Narragansett Bay?? Cannot be! Nevertheless, the entire fleet reduced to 100% jibs and finished the race off Fort Adams in 20-30 kt winds from the SSW. What no one expected was the jaw-dropping events for the awards ceremony held at the Newport Yachting Center that evening. As everyone was enjoying their drinks and reminiscing about the past week, a huge black, ominous squall rolled over horizon from the west across Narragansett Bay. Before everyone knew it, “white water” was blasting across the Bay underneath Newport Bridge and Newport Harbor, the tops of wavelets blown into a white froth, as the wind blast hit the regatta tent, it lifted it up nearly 5 feet! Then, it settled down as everyone just about freaked out, then realized they had experienced a “hurricane-like” blast front and survived intact. The drinks, and awards continued on that night, though a bit more subdued than one might expect. Later, as everyone realized at that first J/24 Worlds in Newport, that Low/ depression became a “super depression” with 70+ kt winds and it devastated the RORC’s Fastnet Race 1979 with the most horrific sailing conditions imaginable for many unfortunate teams; many boats and lives were lost that year in “Fastnet Force 10”. While Ted Turner’s famous TENACIOUS won that race, he still considered the Chicago- Mackinac Race in his equally famous red 12-Meter AMERICAN EAGLE the toughest race he ever sailed. Many J/Boats sailors can relate to both of these experiences, many of whom sailed those two events. The J/24 class has endured “winds of change” over the course of time, from 1977 until the present day. Fleets around the world continue to enjoy close, fun, one-design, family racing, week to week in far-flung places around the world- such as Sydney and Melbourne, Australia; Buenos Aires, Argentina; Williams Bay/ Tierra del Fuego, Chile; Tokyo, Japan; Seoul, Korea; Acapulco, Puerto Vallarta, & Valle de Bravo, Mexico; and, of course, across the USA, Europe, and the United Kingdom. As a result, it is not surprising that a huge turnout of eighty J/24 teams are looking forward to a week of awesome racing at one of the most hallowed waters of one-design racing in the world- the northern end of Lake Garda, Italy. Hosted by the Fraglia Vela Riva, the J/24 teams are in for a real treat of amazing sailing on what many consider to be one of the most spectacular bodies of water to sail- bar none. Notably, the USA crews all have world-class talent on board. In fact, all five teams are at least World Champions or North American Champions in various classes. Given the tight quarters, emphasis on boat-handling, and acceleration/ boat speed, the American teams are likely to excel on the Lake Garda race-track. For more J/24 World Championship sailing information Add to Flipboard Magazine. (Breskens, The Netherlands)- The 2018 J/111 World Championship is being hosted in conjunction with the Breskens Sailing Weekend in the Netherlands. A dozen J/111 crews are participating from five nations (Belgium, Great Britain, Germany, Netherlands, & Switzerland). Racing will take place offshore, in the wide-open North Sea, along the fabled northern beaches of the Benelux seashore. Hosting the event are Watersportvereniging Breskens, Royal Yacht Club of Belgium, Koninklijke Roei & Zeilvereniging De Maas, Koninklijke Nederlandse Roei en Zeilvereniging Muiden, Koninklijke Antwerpse Watersportverenging SRNA and the Royal Netherlands Yachting Union (RNYU). For the past two days, nearly all J/111's have been practicing their skills during the J/111 Pre-Worlds Tune-Up Regatta. 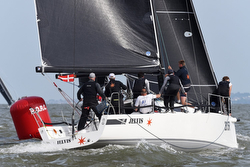 With close racing in continuously changing conditions, Martin Dent's British team on JELVIS took pole position with the Belgians on Sebastien de Liederke’s crew on DJINN following second and the Dutch team of Sjakk Haakman on RED HERRING in third place. 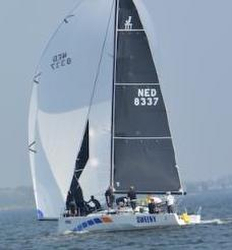 Rounding out the top five were one of the regatta pre-favorites- Paul van Driel’s Dutch team on SWEENY- that took fourth place and Jorg Sigg’s LALLEKONIG was fifth. On Thursday, the "real" work begins with a clean slate for all teams! Game on for the start of the 2018 J/111 World Championship! 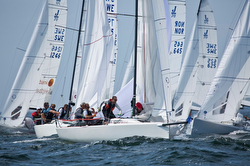 For more J/111 World Championship sailing information Add to Flipboard Magazine. (Newport, RI)- It would be hard to imagine a more successful sailing season than the summer the J/112E sport-cruiser has enjoyed in Europe, and there’s still plenty of summer and fall sailing left to enjoy! Our congratulations to Didier LeMoal, Fred Bouvier and the J/Composites team for organizing a great campaign with J/LANCE 12- capturing both the IRC European Championship and the IRC/ORC World Championship (with Netherlands J/Dealer Gideon Messink skippering). Even more impressive, the J/112E has been one of the few boats in each event carrying a full-on cruising interior. As Paul Heys of J-UK reported- midway through the IRC European Championship in Cowes, England, after seeing how fast the J/112E passed their boat on the race course, one competitor hopped aboard J/LANCE 12 to see what was below. To his great surprise he discovered a V-berth cabin, main cabin table, sit-down nav station, marine head with holding tank, and a galley with stove- everything his current, purpose-built race boat was lacking (a JPK 1080). 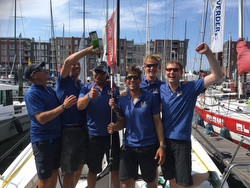 The next day he put a deposit on J/LANCE 12 and, after watching her win the Offshore Sailing World Championship, recently celebrated by winning the IRC 4 Class at Cowes Week! Designing and building high quality sailboats that compete at the highest levels AND pass the family sailing test is no small task, which explains why so few companies do it. From the ramp launch-able J/70 to the open-course J/121, every J/ can be pushed or dialed back to the style and pace of sailing that best suits the owner. Sure, every design strikes a compromise between performance and accommodation to reach a specific design objective, but with a J/Boat there’s a big difference – we never compromise when it comes to the pure joy of sailing. Look for the amazing J/112E at these 2018 Fall Sailboat shows- Newport, Southampton (England), and La Rochelle (France). Learn more about the J/112E sport cruiser here. Add to Flipboard Magazine. 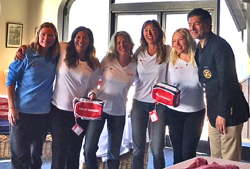 (San Francisco, CA)- Eight teams are set to face off in the 2018 U.S. Women’s Match Racing Championship, hosted by the St. Francis Yacht Club in San Francisco on August 24-26, 2018. With the competition on San Francisco Bay in J/22 sailboats, teams will be racing with high stakes on the line this week. Due to a change in dates for the Nations Cup Grand Final from October, 2018 to April, 2019, US Sailing can nominate the skipper of the 2018 U.S. Women’s National Champion Match Racing team to represent the U.S. at this elite international match racing event. A number of familiar faces in the women’s match racing circuit will be on hand this week, including defending two-time Champion (2016, 2015), Nicole Breault (San Francisco, Calif.). She returns with the same crew from her winning 2016 team, composed of Molly Carapiet (San Francisco, Calif.), Karen Loutzenheiser (Santa Cruz, Calif.), and Hannah Burroughs (San Francisco, Calif.). Carapiet and Loutzenheiser also raced with Breault on her winning 2015 team. Breault is the #1 ranked women’s match racer in the country and #8 in the world. “We are really looking forward to this year’s Championship on San Francisco Bay, especially since the list of highly-skilled and experienced teams racing this week is deep,” said Betsy Alison, Adult Sailing Director at US Sailing. “I expect the competition to be fierce as the competitors hone their skills by taking part in the additional opportunities for quality coaching and a clinic preceding the event." 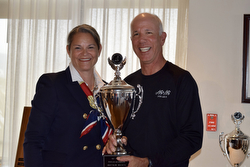 Randy Smith, an active match race competitor, umpire, and longtime PRO for the Congressional Cup, will be conducting a match-racing clinic with the participating sailors on Thursday, August 23. Previous winners of the U.S. Women’s Match Racing Championship include some of the top women’s sailors in recent U.S. history. Cory Sertl, Betsy Alison, Sally Barkow, Anna Tunnicliffe, Stephanie Roble, Genny Tulloch, Liz Baylis, and Debbie Cappozi have all won this US Sailing National Championship. For more US Women’s Match Racing Championship sailing information Add to Flipboard Magazine. (Put-in-Bay, Ohio)- “J/Boats took the top two positions in the annual Sandusky Ohio Deepwater race on August 2nd. The Deepwater is a feeder race from the entrance of Sandusky Bay in the shadow of Cedar Point Amusement Park, amongst the islands of Lake Erie's western basin, to Put-in-Bay on South Bass Island, where the Inter Lake Yachting Association holds its Put-in-Bay Race Week series and festivities each summer,” commented Phil Dufresne. Taking top honors in the PHRF class was Bill Kellner's J/92 JUMPSTART followed in second place by QUADRIFOGLIO, a J/29 sailed by Phil Dufresne. Add to Flipboard Magazine. 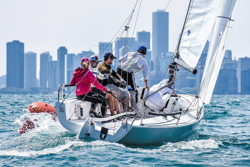 (Chicago, IL)- From August 24th to 26th, the Chicago YC will be hosting the Verve Cup Inshore Regatta on the challenging waters of Lake Michigan, right off the majestic waterfront of Chicago. 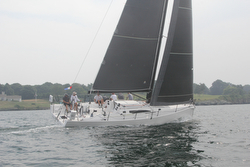 Participating are seven one-design fleets, with the largest participation coming from the J/70 and J/24 classes. Ten J/70s are racing, including top local teams like Sarah & Mark Renz’s BERTEAU GROUP, Steve Knoop’s AMERICAN FLYER, Tod Sackett’s FM, Amy Neill’s NITEMARE, Bob Willis’ RIP RULLAH and Ray Groble’s TAIPAN (a leading Midwest youth team). The J/24s are also showing up in force, with nine boats heading for the starting line on Friday. Many teams are traveling from all over the Midwest- from Minnesota, Indiana, Wisconsin and Illinois. Locals include Mark Soya’s BREAK AWAY, Dan Walsh’s GOLD RUSH and Ed Leslie’s JAMMIN. Visitors include three teams from Minnesota- Cory Huseby’s BORK BORK BORK, Eric Christenson’s BUBBLES, and Josh Bone’s MOTORHOME. Two are from Wisconsin- Ben Stauber’s INSATIABLE and Ed Leslie’s JAMMIN. Joining the fun from Indiana is Rick Graef’s DON’T PANIC. 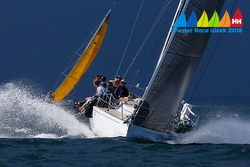 For more Verve Cup Inshore Regatta sailing information Add to Flipboard Magazine. 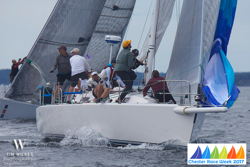 (Marblehead, MA)- The annual Storm Trysail Club Ted Hood Regatta taking place from August 24th to 26th is normally a fun-loving, locally-based, regatta for J/70s, J/105s, and a variety of PHRF handicap racing teams. However, in 2018 the regatta has taken on a bit more significance since the presence of forty-six J/70 teams is an outsized, enormous fleet that is using the event as “practice” for the upcoming 2018 J/70 World Championship being hosted by Eastern YC in late September. Not surprisingly, many of the top USA teams will be present in the huge J/70 class, hoping to test new sails, refine tuning for speed, and iron-out boat-handling techniques. Those teams range from Minnesota to Texas, from California to Massachusetts. From the West and South are crews like Jack Franco’s 3 BALL JT from Texas; Pat Toole’s 3 BIG DOGS from Santa Barbara, CA; Doug Strebel’s BLACK RIVER RACING from Dallas, TX; Mallory & Andrew Loe’s DIME from Seattle, WA; Glenn Darden’s HOSS from Ft Worth, TX; Jim Cunningham’s LIFTED from San Francisco, CA; Bruce Golison’s MIDLIFE CRISIS from Long Beach, CA; and Bruno Pasquinelli’s STAMPEDE from Dallas, TX. From the Midwest and East are leading crews such as John & Molly Baxter’s TEAM VINEYARD VINES from Riverside, CT; Jud Smith’s AFRICA from Marblehead, MA (a true “home-boy” in these parts); Joel Ronning’s CATAPULT from Excelsior, MN; John Heaton’s EMPEIRIA from Wilmette, IL; Tod Sackett’s FM from Cleveland, OH; Marty Kullman’s HYDRA from St Petersburg, FL; Ray & Jenn Wulff’s JOINT CUSTODY from Annapolis, MD; Bill Lynn’s KEY PLAYER from Marblehead, MA (another “home boy”); Tim Healey’s NEW ENGLAND ROPES from Newport, RI; Oivind Lorentzen’s NINE from Stamford, CT; John Brim’s RIMETTE from Fisher’s Island, NY; and Brian Keane’s SAVASANA from Beverly, MA. Joining that rather formidable group of top USA J/70 teams from the R.O.W. is the famous Italian crew on MASCALZONE LATINO (Vincenzo Onorato) and Renato Faria’s team from Rio de Janeiro, Brazil on TO NESSA. Meanwhile, the J/105s are turning out in force with a strong showing of nearly a dozen boats. Notable class leaders include teams like Dave Nelson’s GOT QI from Hingham YC, Steve Hollis’ SIROCCO from Jubilee YC, and Mark Masur’s TWO FEATHERS from Ft Worth Boat Club in Texas. A new feature for the event this year is the ORR-EZ class of nearly two-dozen boats. Featured among them are eight J/Crews that range from 24 ft to 43 ft! Those teams include Fred de Napoli’s J/124 ALLEGRO MALVAGIO, Tom Mager’s J/122 GIGI, Chris Zibailo’s J/112E DOPODOMANI, Ed Kaye’s J/111 PRAVDA, Gary Weisberg’s J/111 HEAT WAVE, and Dan Boyd’s J/109 WILD THING. For more Storm Trysail Ted Hood Regatta sailing information Add to Flipboard Magazine. J/122 EL OCASO Charter- Caribbean Regatta Circuit! 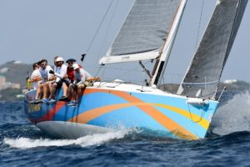 (English Harbour, Antigua)- Interested in taking your team to race a Caribbean Regatta in 2019? Caribbean Yacht Racing can help you make it happen...just arrive and race! Caribbean Yacht Racing offers a complete charter package, simply arrive to the location with your team and the highly competitive J/122 “El Ocaso” will be ready to race. CYR can also assistant with team logistics, including lodging. If you are interested, please contact Bob Hillier- bob@caribbeanyachtracing.com- for complete charter details or visit http://www.caribbeanyachtracing.com Add to Flipboard Magazine.